Confession: I didn’t like Brussels sprouts until a few years ago. Now, they might be my favorite vegetable. Prepared properly means two things – trimming the stem, which gives Brussels sprouts that bitter taste, and not overcooking, which can also make them bitter. And all sorts of mushy. 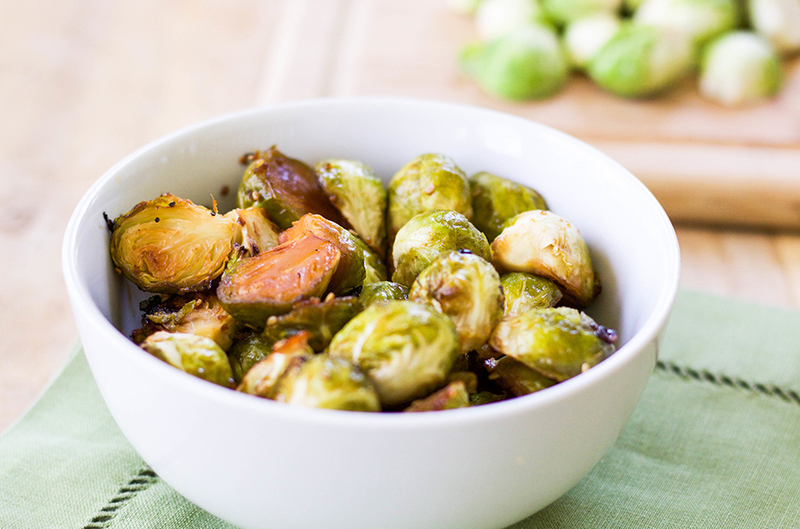 If cooked until tender-crisp, and drizzled with a little love and flavor, Brussels sprouts are simply delicious. A member of the brassica family, along with broccoli, Brussels sprouts contain potent cancer-fighting chemicals and are chock-full of fiber, vitamin C, and vitamin K.
I love Brussels sprouts when they’re sauteed (blanch first), and grilled (use similarly-sized sprouts on a skewer), but my favorite way to enjoy them is roasted, so they take on a nice caramelization. Sometimes, I’ll keep it simple – olive oil, garlic and salt, but most of the time, I make what my family now calls my “So, you think you don’t like Brussels sprouts?” recipe. This dish will turn the most hesitant, the pickiest, the “there’s-no-way-I-am-eating-Brussels-sprouts” eater into someone who asks for seconds. It’s true. Not that I’m counting, but this recipe has converted our 19 year-old daughter (who incidentally, closed her eyes for her first taste test), my brother, one of my best friends, my best friend’s daughter, and the pickiest person I know, my “I don’t eat green things” niece (full disclosure: I told her they were mini-lettuce heads). This is one of my go-tos, and as with all of my go-tos, it’s super easy to prepare. 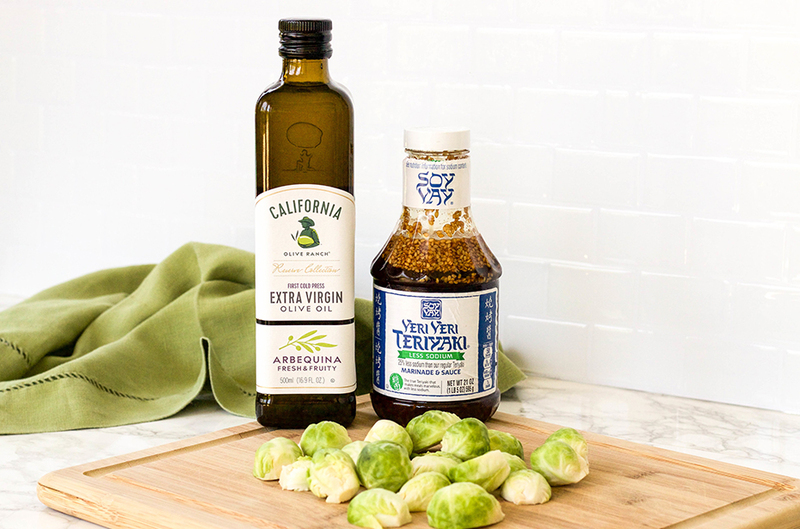 Originally passed on by friend and fellow registered dietitian, Andy Bellatti, it requires only three ingredients: the sprouts, quality olive oil, and a good teriyaki sauce. If your sprouts are small, you will want to keep them whole, but still trim the stem and remove the outer leaves. To prep the Brussels sprouts, trim the stem, remove the outer leaves, wash, and slice vertically. Place on a rimmed sheet pan (use parchment paper for easy cleanup), and toss with the olive oil and teriyaki sauce. Mix well. Place the sprouts cut side down. 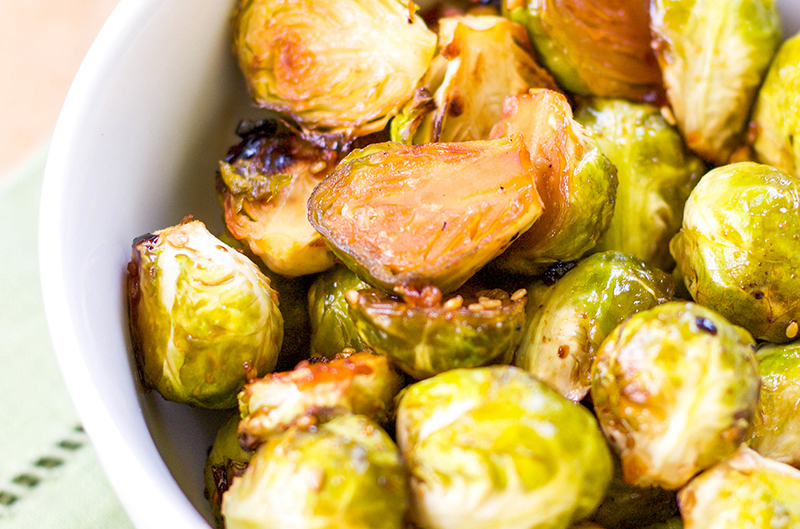 Roast in the oven for 15-25 minutes (more for larger sprouts), tossing once or twice until they are crisp-tender. Avoid overcooking. Enjoy, and be ready when they ask for seconds. Don't discard the outer leaves; use them to make Brussels sprouts chips!